“Frank was teaching from home. After only three months, up to 70 people were coming,” Jane recalls. Running a studio was the dream. Frank had often thought the Masons Hall in Clifton Hill would make a great place for a studio. The building came onto the market but the rent was high and it needed a lot of work. But they agreed it was too good an opportunity to pass up. The hall, owned by the Samian Social Club, had been used for weddings, parties and other functions. On first inspection Frank and Jane discovered how much work they would need to do before they could open the doors. “It was completely dark. There was no natural light, and the windows were blocked off. It had the fragrance of a nightclub – beer and other alcohol – and this horrible red carpet,” says Jane. Even the lights didn’t work properly. But Jane knew the open spaces on offer would be ideal for a yoga centre. The landlords agreed to a rent-free period until Frank and Jane renovated the premises and acquired their permits. The carpet was the first thing to go. It revealed New Zealand kauri pine floorboards. “We were really delighted with the beautiful solid floor. We polished the floorboards and painted the walls,” she says. The first visitors were greeted by racy red carpet in the foyer, as the new custodians could only afford to renovate in stages. In fact, the couple was renovating their house at the same time. “Instead of finishing off the house, we used the money we had saved to renovate the studio. There was a large bay window at the rear of the house that we couldn’t afford to complete, so we put a wall of plastic across it instead,” recalls Jane. “It was double-glazed plastic,” she adds, with a laugh. 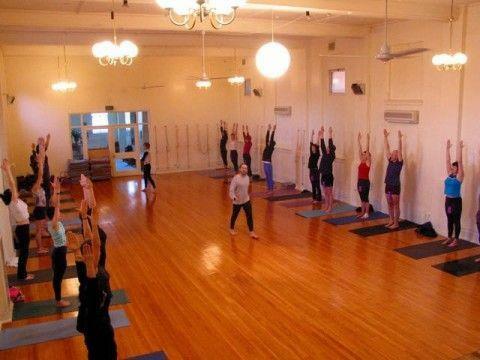 “We knew that this was going to be Melbourne’s biggest yoga studio. We had 40 classes a week. It was very exciting and a little tense because we weren’t sure if it was going to work or if it was too big. The quiet and peaceful place Frank imagined emerged when the first studio was ready for business, and the second and third upstairs studios were completed a couple of years later. The studio went from 70 students per week to over 800. Frank started yoga in response to a back injury caused on another building project: the construction of his family’s mud-brick home, which he built with his brothers. His treating chiropractor and friend introduced him to Iyengar yoga. “I immediately found something I’d been looking for. It had a profound effect on me,” explains Frank. He always did physical activities such as working outside but sport never interested him. Yoga bridged the gap. Frank spent 10 years practising yoga before becoming a teacher. He says teaching is a yogic process in itself. Tim Bosworth never had the intention to run a yoga school. While living in Fremantle in the ’90s he took his first class with John Leebold. He bought into the Clifton Hill business in 2008, following Alan and Archer’s purchase in 2007, having been one of its longest serving students, and a teacher since 2005. “I joined Clifton Hill when the school was really finding its feet,” Tim says. “They just had Frank’s most successful group of teacher trainers. David Spratt was on board in managing the business and seminal in getting the place humming. He was the eye and hand of the administration behind Frank. There was an upbeat feeling in the teaching group. “Frank is a fairly unique character in the yoga world,” he says, highlighting Frank’s softness and gentleness and his ability to share easily with his students. The thousands of people who have walked through Clifton Hill Yoga Studio’s doors understand the gravitas of the place. Like Frank, and many yoga teachers before him, Tim has visited Pune in India to study under the late Mr BKS Iyengar. Tim’s vision for Clifton Hill Yoga Studio is to teach the people yoga is more than an exercise.